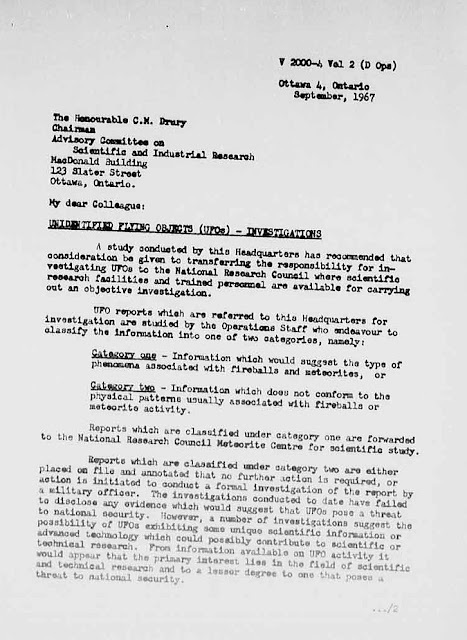 From all accounts, 1967 was a big year for UFOs in Canada. It was a major wave year around the world, and Canada was a part of it. Not only was there a large number of UFO sightings in Canada that year, but many of the cases were truly remarkable, with many Close Encounters, reputable witnesses, and objects that seemed to defy explanation. In addition, many of the cases were intensively investigated by military officials, police and other recognized authority. 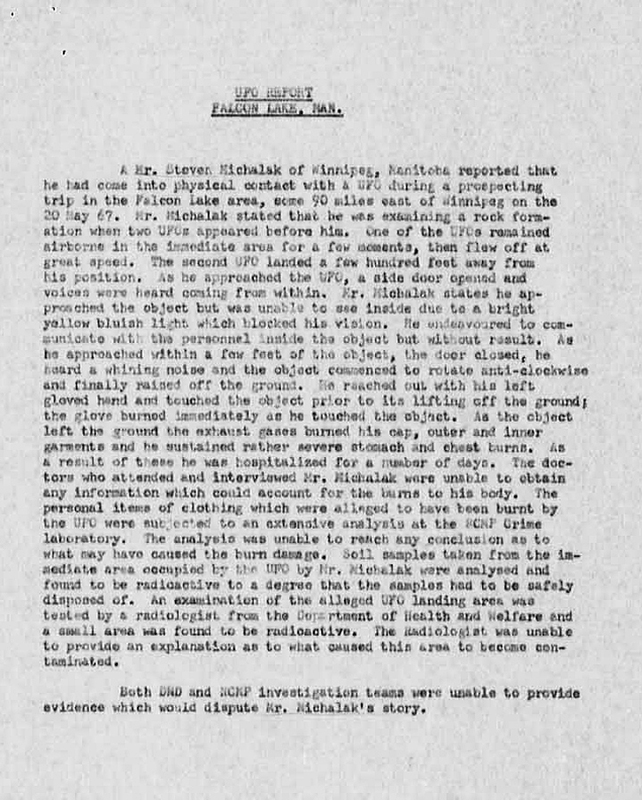 Also, an official memo dated November 1967 listed three cases that were "unsolved": Falcon Lake, Duhamel. and Shag Harbour. In a two-part blog post elsewhere, I gave a list of all known Canadian UFO cases in 1967, with citations and/or sources. But below, I have pulled out details on a few dozen Canadian UFO cases from 1967 that are the most interesting or unusual, and in some cases, well-documented. Witness approached landed object, violet light, rushing air sound, voices heard; experienced severe burns on chest, weight loss, and vomiting ((Hall, 2001, pp. 209-212; Clark, 1996, pp. 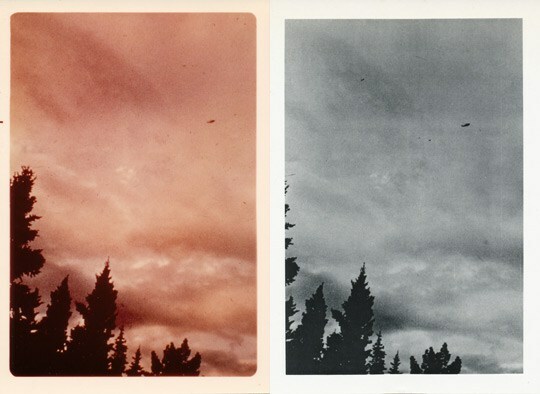 191-200; Craig, 1995, pp. 14-27; Gillmor, 1969, p. 316, Case 22; Story, 1980, pp. 230-31; International UFO Reporter, Nov.-Dec. 1987, pp. 21- T, 24; Journal of UFO Studies, New Series, Vol. 5, pp. 1-34; Flying Saucer Review, 1981, vol. 27, no. 1,pp. 14-16; FSR, vol. 27 no. 2, pp. 15-18; FSR, vol. 27 no. 3, pp. 21-15; Winnipeg Free Press 5/23/67; The Tribune, Winnipeg, Manitoba 5/22/67). Dennis Leger, 12 ans, and Michel Montreuil, 15 ans, were riding their bicycles across a farm field when they suddenly came upon a “stationary transparent vehicle” hovering about 15 feet above the ground. Inside the transparent object the boys could see three black creatures “like Michelin man” about 4 feet tall. One was standing by itself on the left while the others were sitting on the right. A Lake Nipissing, Ontario buoy tender observed green and white lights between two small islands. Thinking another boatman might be in trouble, the buoy tender headed toward the lights. He was about 100 feet away when the lights rose from the water 'with a whoosh' and sped off into the night. An RCMP officer and a RCAF squadron leader saw a silvery circular or slightly oblong object flying rapidly to the north with a wobbling motion. The object was visible for about 15 seconds. (Winnipeg Free Press, Manitoba, 6/29/67, copy in NICAP files; Winnipeg Free Press 6/7/67 with date of sighting indicated as June 6, copy in NICAP files; case reported to the University of Colorado Project). Cigar shaped craft with four evenly spaced small windows, 36' long; smaller disc 15' diameter. Both hovered 12' above ground. three small men, miner helmets on ground under boom on cigar. Ground marks. At 2:30 a.m. Carmen Cuneo, a night shift worker at a factory in Caledonia, Ontario saw two objects near the factory's scrap heap and dump area: a large cigar-shaped object on the ground, 35 feet long by 15 feet thick, and a hovering disc-shaped object about 15 feet in diameter. The smaller object, tilted up at a 45-degree angle, had a row of orange-lighted windows around its periphery. In the larger object were four square windows emitting a pulsating orange light, and from one end of it projected upward at a 45 degree angle a rod 15 feet long, bearing a large red light at the end. Beneath this light moved three small humanoid figures about three feet tall, wearing miner's hats with small lights on them. They were picking up and examining small objects on the ground with quick, jerky movements. After watching for 10 minutes, Cuneo called co-worker Marvin Hannigan to see it, but by the time Hannigan arrived the humanoids were gone. The two craft started very slowly to rise straight up into the air. After they reached a height of 50 feet they departed at about 40-45 mph without making a sound. At the landing site branches were broken and the brush charred, and an oily liquid was found on the ground. A woman was walking through her house when she heard an odd beeping sound. It was repeated at regular intervals of about one second, and she wondered what was causing it. She looked out her kitchen window, and saw dirt and loose pieces of paper flying in a large circle around her house. Outside, she found her husband, who had just come home, and five children staring up into the sky. A young boy was holding her eight-year-old daughter down on the ground. Up in the sky a rectangular object hung in the air, slowly rotating counter-clockwise and showing alternating silver and black sides. It was black on its lower surface, and made no noise. The object began moving off at an angle, stopped and hovered, then continued towards the southeast. Until this time the circle of dirt and dust had persisted, but it now died down. The whirlwind was confined to the area immediately around their house and did not affect any other houses on the street. When the object moved away, the dirt fell to the ground. Going to the children, the woman found they were calming down except her daughter, who seemed dazed. The boy explained that the five of them had been playing in the yard when the object first appeared overhead. 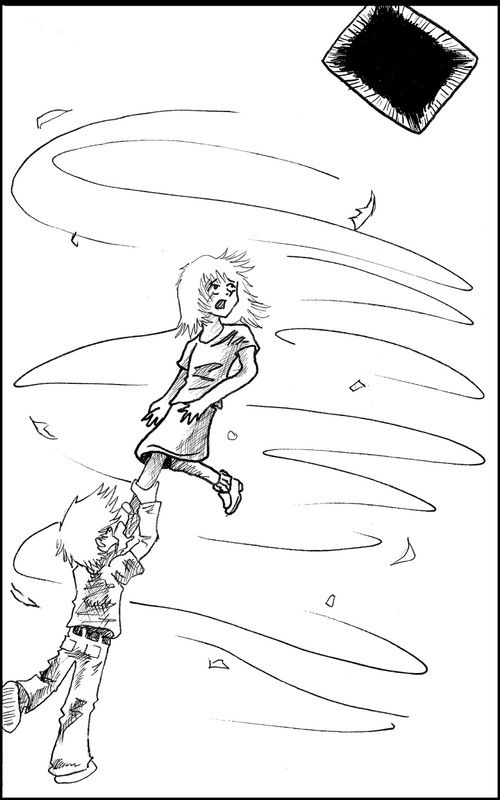 As they watched, her daughter had been levitated into the air, apparently caused by the UFO in the sky. By the time the other children had come to her aid she was about one meter off the ground and her clothes had edged up her body. Her daughter said she did not remember anything from the time she felt the wind until the time she recovered after being dragged back to the ground. Warren Smith and two companions were prospecting when they noticed a shiny, disc-shaped craft in the air, estimated to be about 25 feet in diameter, and about 2,000 feet in altitude, two miles away from them and approaching from the east. Smith took two photos of it as it continued on, losing altitude, passing behind some trees and then rising again. The photos were examined by both Canadian and American authorities and were described as some of the best photos on record at the time. An analysis by DND: oblate ellipsoid or torus, 40-50 feet diameter, 11.5-14 feet depth, metallic, shiny, minimum distance 2000 feet. The witnesses signed statutory declarations to the effect that the photos were not a hoax; if proven false, they would have been subject to prosecution under the Canada Evidence Act. 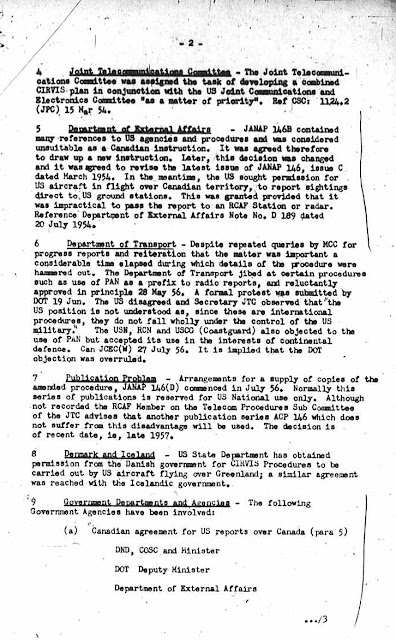 Nevertheless, the USAF-sponsored Condon Report felt it could also have been a hand-thrown model and a hoax. Dr. J. Allen Hynek stated: “best daylight disc photograph I have personally investigated.” That says it all! Definitely one of the best of the early days. A school bus driver said she took photographs of a bowl-shaped, dull aluminum object with an upturned rim. The photos were sold to several magazines for an undisclosed sum. An UFO investigator found that the object in the photographs was identical in appearance to a “seismographic plug” used to cap oil wells, found commonly throughout the surrounding area. At a farm area a young boy heard a loud oscillating sound, going over a nearby hill he saw a landed disc shaped craft on four metallic legs, it was actually hovering just above the ground. On a platform around its perimeter, were seated eight to ten little men about three-foot tall, they wore tight fitting brown clothing. A depressed 12-foot circular area was found on the ground later. There were six witnesses, three of whom were military personnel: LAC J. Hebert, LAC K. Taylor and CPL A Fedun, all stationed at CFB Rivers, plus civilians Judy Ross, Leslie Dowdell and Jacqueline Dowdell, all of Rivers. Hebert and Ross were driving one mile east of Rivers, Taylor was 8 miles east, Fedun was in the town, and the Dowdells were at a different location in the town. In other words, we have six observers scattered across four different locations. Two more military personnel, CPL K. McArthur and G. Stefanson, a Commissionaire, both at two additional different locations on the Rivers base, reported hearing an “explosion” that rattled windows and created “vibrations.” LAC Heberts car detained at ME section. Body repairman states light dust on top of car is unlike any other in his experience. There was some “bubbling” of paint on top. This incident reported to TCHQ by base duty officer. 18-year-old Evan Evanson was driving on Highway 36, one mile south of Highway 3, when he noticed his pick-up truck was running hot and he stopped to let it cool. While he sat in his truck, listening to the radio, he saw a large green object that looked like two flattened bells one above the other. It was noiseless but beeping sounds started coming from the radio. The object disappeared abruptly. At 11:20 p.m. Atlantic Daylight Time at least one and most likely two separate UFOs dove or crashed into the ocean near Bon Portage Island, in the area of Shag Harbour, Nova Scotia. A little bit after 2300 an unknown object with four bright lights flashing in sequence and estimated at 60 feet in diameter, was observed hovering over the ocean near this small fishing village. Suddenly the mysterious object tilted at a 45-degree angle and then rapidly descended to the sea below. Next there was an explosive noise and a bright flash of light. Calls were made to the Barrington Passage RCMP detachment. Initially, the authorities suspected that a conventional aircraft had probably gone down, and so the immediate concern was for the rescue of possible survivors. When three RCMP officers first arrived, they could still observe the mystery object afloat about a half-mile out from shore. One of them, Constable Ron Pond had seen the UFO before it went down, and was baffled by its unusual appearance. Out on the ocean, the object gave a pale yellow illumination and there was dense yellow foam on the water. When a coast guard lifeboat and several fishing boats managed to get to the site, the object had submerged beneath the waters, although sulfurous smelling yellow foam continued to emerge from the waters, creating an estimated 80 ft wide and half a mile long slick on the surface. Investigators came up with the following discoveries: There was a secret military recovery attempt, it appears, at a site some 25 miles up the coast near the community of Shelburne Nova Scotia. Reportedly, the military secretly watched as another mystery object beneath the waters approached and seemed to be making repairs to the first. In the meantime, a Soviet submarine violated the then 12-mile international shore limit, in an apparent effort to get close to the action. But then the two mystery objects began to move off together, heading towards the Gulf of Maine, where they allegedly resurfaced and flew off, witnessed in the vicinity of Yarmouth, Maine. The same night as the Shag Harbour "crash" there were several other substantial UFO sightings reported over eastern Canada. A fishing vessel, with 18 men onboard (the M V Nickerson) observed four UFOs off of Sambro, Nova Scotia. They even had solid returns on their Decca radar. This occurred about a half hour before Shag Harbour. Also prior to Shag Harbour, the pilot and co-pilot of Air Canada Flight 305 westbound between Sherbrooke and St Jean, Quebec, reported UFO activity. The object was sighted one mile N of Elnora by several of the train's crew. Elnora is about 35 miles SE of Red Deer. Engineer William (Ben) Benwick): "If I'd had a sling-shot, I could have knocked it down". It was an unidentified flying object that Benwick and other crew members of the CNR 443-North speed freight say followed them early that Friday morning. Mr. Benwick, of Calgary, said the object flew alongside the train at a distance of about 100 yards. On one occasion, he said it dived toward the train and came much closer. At first he had been reluctant to report the incident to a newspaper. "I thought everybody would take me for a nut," he said. He told The Journal that the train was going at about 50 mph at the time and that the UFO followed along. When they stopped at Alix to drop off a car, it stopped also and "Just hung there." It then followed the train all the way into Mirror. 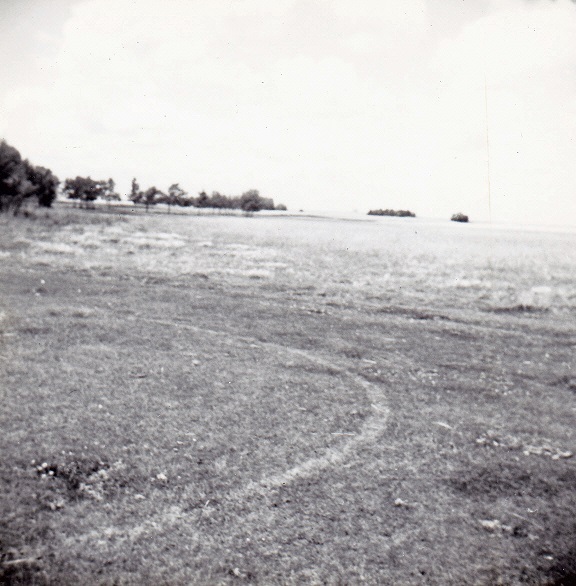 Benwick described the UFO as being a little more than the length of a boxcar in diameter, about 40 feet. It had colored lights around the rim which flashed red, green, orange, and yellow. Its top cone was black, and underneath there was a circle of glowing light, about 10 feet in diameter. "When we got to Mirror, I told the operator there about it, and he asked what I had been drinking. I told him: 'There it is, right in front of you,' and he just said: 'My God'." The CNR operator at Mirror, Larry Mazure, later told Mr. Benwick that the UFO hovered about 15 miles east of Mirror for two hours more before it left. The same night, Mrs. David Soppit, who lives about five miles west of Mirror, reported to The Journal that she had heard a humming or whirring noise, and when she looked out the window she saw an extremely fast moving light in the sky. The following night, the engineer of another freight train, Hubert Schmidt, also reported the sighting of a UFO. David Seewalt, 13, started a 3 minute walk home at 1745, but did not arrive until 1830 when he dashed in and tried to hide under the bed, saying "I've been chased by a flying saucer!" He seemed to be in shock and one of his shoes was missing, found later in the road nearby. Five months later, he had a nightmare, after which he told his father he knew what had happened to the missing time. Under regressive hypnosis, the boy recounted having been abducted into a low flying UFO by means of an orange light beam; inside the object he was undressed and examined by a being with "a rough brown skin like crocodiles." It was assisted by at least 3 other similar creatures and they communicated with each other in voices that sounded "like a kazoo." Their hands had only 4 fingers. David was wheeled into an "operating like" room for the examination; at the conclusion, they put his clothes back on and beamed him back into the field where he had been abducted. Michalak knelt behind a rock outcropping, trying to remain hidden from sight, making a sketch of the object and noting things like waves of warm air radiating from the craft, the smell of sulphur and the whirring of a fast electric motor and a hissing, as if air were being expelled or taken in by the craft. Brilliant purple light flooded out of slitlike openings in the upper part of the craft, and a door opened in the side of the craft where he could see smaller lights inside. Michalak warily approached to within 60 feet of the craft and heard two human‑like voices, one with a higher pitch than the other. Convinced the craft was an American secret test vehicle, he walked closer to the craft, ending up directly in front of the open doorway. Suddenly, the craft rotated and an exhaust vent of some kind blasted hot gas hit him in the chest, setting his shirt and undershirt on fire. Michalak immediately felt nauseous and his forehead throbbed from a headache. He decided to return to Winnipeg where he was taken to the Misericordia Hospital. He was tested for radiation contamination, since some radiation was found at the site where Michalak said he had his experience. He did exhibit some very unusual ailments, including reported weight loss, peculiar burn marks on his chest and stomach, charred hair, an odd rash and recurrent dizziness. He was interviewed by the RCAF and RCMP. He led officials to the site, where the Department of Health and Welfare found such high levels of radiation that they considered cordoning off the area for a short while. Michalak spent a great deal of his own money traveling to the Mayo Clinic, as it was not covered by Medicare. The results of the tests were negative; the physicians could find no explanation for his symptoms, and psychiatrists concluded he was not the type of person who would make up such a bizarre tale. If it was a hoax, it is the most contrived on record, involving radiation, contaminated soil, medical examinations and a flurry of interrogation by government officials at many levels. Radioactive pieces of metal were even recovered from the site, leading to much speculation on what they are and how they got there. 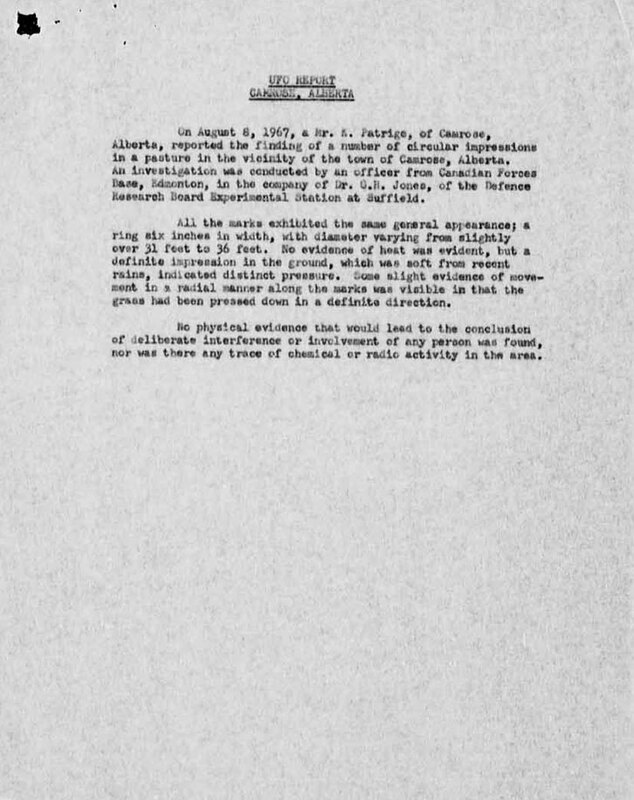 Access to Information requests and perusal of records in the National Archives of Canada have uncovered as many as one hundred official documents about military and government investigations of the incident. 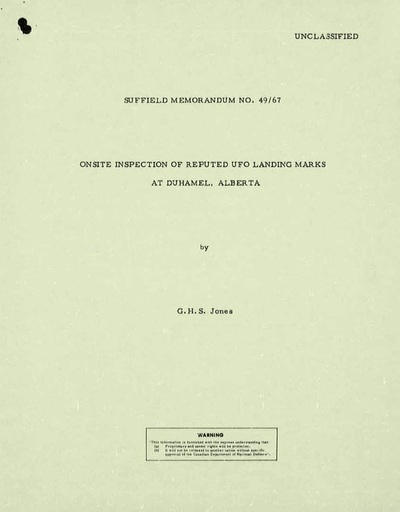 Civilian records and reports number in the hundreds as well, helping to make the Falcon Lake case one of the best-documented on record, easily surpassing some of the classic and well-known UFO cases such as Roswell and Shag Harbour. The case is examined in detail in an upcoming book by Stan Michalak and Chris Rutkowski. A series of events commemorating the 50th anniversary of the incident is planned for May 1967. I have gone through all available records for notes or listings of Canadian UFO cases from 1967. That year is significant, in my opinion, because of the many unusual sightings and trace cases reported during that year. It was a remarkable time in Canadian history - a decidedly different kind of historical record than usually promoted. And, since this is Canada's 150th birthday, what a better time to look back on a remarkable period in our history. American Institute of Aeronautics and Astronautics (AIAA) establishes UFO subcommittee. Wesleyan University offers first credit course on UFOs. Soviet TV announcement reveals short-lived non-governmental UFO group. Note: Indented listings are duplicate case reports with supplementary information. Three objects were observed on the shore. Goose Bay AFB, Labrador (BBU), 11:00-11:05 p.m. (AST). An unidentified object was sighted, but with appearance and behavior that most likely would have a conventional explanation. Electromagnetic effects were noted. Nocturnal lights were reported on the shore. Explanation: Satellite. A flying disc was observed. One disc was observed by several witnesses. Air Canada 309 incident. Nocturnal lights were observed by a group of witnesses. An odd light intrigued a family. Then, estimated on the ground at 2000 feet distance, it intrigued them more. The 3 men leave on snowshoes believing that it is a plane in breakdown. At 200 feet apart, they notice a saucer of 30 x 18 feet, oval, color aluminum gray, dirty with 4 square and incandescent portholes, and what looked like a red light at one end. The red halo becomes an enveloping orange net. The air vibrated and there was a slight whirring. The object rose in a flash and disappeared into the night becoming a tiny star in the sky towards the East and Île d'Orléans. Snow would have melted (50 inches) and the grass would have been burned. One disc was observed by one witness in a rural area. Bright white light hovered over microwave relay tower. Objects were observed. Multiple independent witnesses. More than two discs, about 40 feet across, were observed by over 30 witnesses for a few seconds (Allen). One object was observed by several witnesses. A flying disc was observed. One disc was observed by ten witnesses. Flying discs were observed. Five discs were observed by two witnesses. Large yellow glowing object flying at treetop level, loud roaring noise, as if from object hovering over home. Explanation: Star. A flying disc was observed. One disc was observed. An object was sighted that had an appearance and performance beyond the capability of known earthly aircraft. One object, the size of the moon, was observed by several teenage witnesses at a dump (Nerada). A flying disc was observed. Gravity effects were noted. One disc was observed by four witnesses for 30 minutes. One disc was observed by one witness. A flying disc was observed using optical instruments. Multiple independent witnesses. One disc was observed by three witnesses for over 15 minutes. One object was observed in snowy weather at an electric plant (Yamitski). An unusual object was sighted, that had unconventional appearance and performance. One object was observed by two male witnesses on a farm. Cat. 9. Ground-visual, civilian and military radar, airline crew observation. An unusual object was sighted, that had unconventional appearance and performance. One object was observed by one female witness on the ocean (Flick). An unidentified object was sighted, but with appearance and behavior that most likely would have a conventional explanation. One object was observed by two witnesses, a married couple, at an electric plant (Siemens). One object was observed by three witnesses for 180 minutes. An unusual object was sighted that had unconventional appearance and performance. One object was observed by more than four witnesses for 30 minutes (Green). A flying disc was observed. One disc was observed by nine witnesses. A very bright object at ground level, illuminated the countryside with a pink glow. Nocturnal lights were reported at a lake. Nocturnal lights were observed by a male witness at a mountain (Arychuk). An object was observed. Multiple independent witnesses. One object was observed in snowy weather by two witnesses, a married couple, at a mountain for over three minutes (Mewburn). Large domed disc zig-zagged east rapidly to the west overhead. Made steady whirring or humming sound. Two boys saw an orange disk, less than one meter in diameter, flying at high speed, stop and hover for three minutes, 20 meters above ground. An unidentified object was sighted, that had an unusual appearance or performance. One object was observed by one experienced male witness (Pereduda). An unidentified object was sighted, that had an unusual appearance or performance. One object was observed by more than one witness on a river (Tonner). An unidentified but otherwise conventional object was sighted. One object, larger than a star, was observed by one female witness for 30 minutes (Bennet). An unusual object was sighted by multiple witnesses, that had unconventional appearance and aerobatic performance. One object was observed by two witnesses in a yard for ten minutes (Fandrey; Neibrandt). A flying disc was observed. Multiple independent witnesses. One disc was observed by one witness (Nickerson). An unidentified object was sighted, but with appearance and behavior that most likely would have a conventional explanation. Explanation: Meteor. One disc was observed by several witnesses (Dorman). Green sphere with red and white lights blinking on and off, two vapor trails, red sparks. Object changed direction when car did, stopped suddenly. Likely same case as next ones in list. Date incorrect? Small glowing sphere with metallic band, emitted two vapor trails, humming sound, approached, paced car. A meteor-like object was observed. Multiple independent witnesses. One object was observed by several witnesses (Toop). An unidentified object was sighted by multiple independent witnesses, but with appearance and behavior that most likely would have a conventional explanation. One object was observed by one male witness (Zonnekyn). An unidentified object was sighted by multiple independent witnesses, but with appearance and behavior that most likely would have a conventional explanation. One object was observed by one experienced male witness at a lake (Moore). An unidentified object was sighted by multiple independent witnesses, but with appearance and behavior that most likely would have a conventional explanation. One object was observed by one female witness (Stoughton). One object was observed by one witness for 18 seconds (Tetroe). A Pacific Western Airlines pilot and crew saw a dull orange-red object that flew erratically as it paced the aircraft, then sped away. Confirmed by radar at Edmonton International Airport (radar-visual). (Redden phone call, 4/7/67, NICAP files; Weinstein, 1999, p. 35 from Gillmor, 1969.) Same case as below. An object was observed. Animal reactions to the object were reported. One green fireball was observed by a female 13-year-old witness in a forest. An unusual object was sighted, that had unconventional appearance and performance. One object was observed by two witnesses, a married couple, for over four minutes (McKay). An unidentified object was sighted, but with appearance and behavior that most likely would have a conventional explanation. One object was observed by three witnesses for 54 seconds. Cigar-shaped object with bright red and white lights, hum. An adult leader and 18 Girl Guides saw four lens-shaped discs with flashing lights on the rims (body lights). The objects circled the witnesses, and two shot away when an airplane approached (aircraft avoidance). 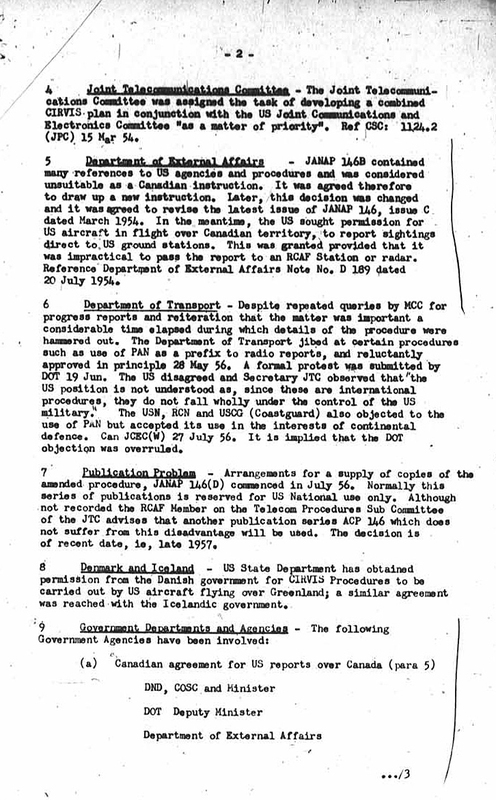 (Henry McKay report, 4/17/67, in NICAP files.) Same report as below. Four lens-shaped discs with flashing lights on rims circled a group of 20 witnesses. Two shot away on approach of aircraft. One object was observed by one witness on a farm. An object was observed. Electromagnetic effects were noted. One object was observed by several witnesses. Explanation: Meteor. Two rotating red glowing dome-shaped objects separated by bar, hovered overhead, shot away rapidly to the north. Unidentified but otherwise conventional objects were sighted. Two objects were observed in clear weather by two male teenage witnesses on the ocean. Three objects were observed by several witnesses. Two rotating red, glowing dome-shaped objects separated by a bar (dumbbell shape) hovered overhead, then accelerated away. (Letter dated 4/16/67 in NICAP files.) Same report as April 14, with different date. Dog sitting very quietly as engulfed in UFO beam. Same case as above. Animal reaction. Object with intense red light descended, turned green, emitted light beam onto neighbor's dog, object then flashed, turned yellow-white, moved away erratically. Third report. Ground marks. 1.5m tall oil-drum shaped cylinder descends, extends 6 legs and lands. 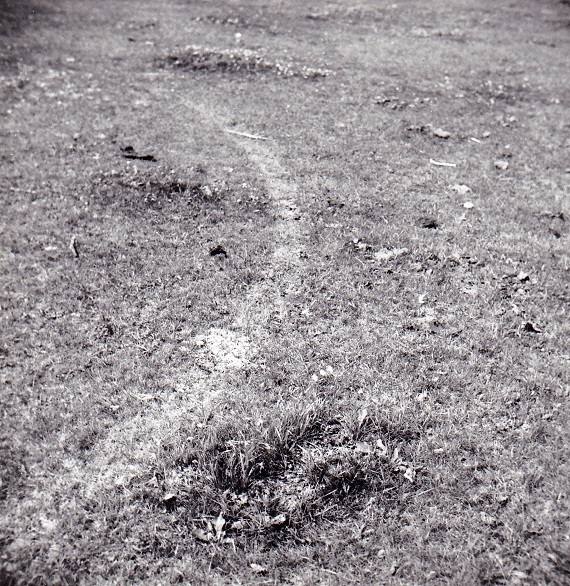 Traces: 6 marks in ground. Four reports in total. Brian Dorscht saw a dark object, measuring one meter in diameter, landed. An object 4 feet wide and 6 feet high, with a blinking green light and white lights was observed around 9:00 pm. The object had six legs and a whirring heard. The witness was buried. Six imprints were found. Metallic elliptical object with belt of alternate red and green lights, hovered, descended, witness became frightened and fled scene. Second report. Downsview, Ontario - A flying disc was observed. One disc was observed by two witnesses, a married couple, for over four minutes (Oosterdag). Vauxhall, Alberta - Electromagnetic effect: headlights died in two separate cars. Distant Nocturnal light in sky, shape indiscernable. A UFO was seen over a house by some neighbours who tried phoning the owners but the line was always busy. The next day, the neighbours inquired of the owners, who insisted that they had not been on the phone that night. An unidentified but otherwise conventional object was sighted. One object was observed by one female witness. 7 May 1967 02:00 - Edmonton, Alberta - An object was sighted that had an appearance and performance beyond the capability of known earthly aircraft. 7 May 1967 02:00 - Edmonton, Alberta - White beam of light came from bottom, made a muffled whistling noise as it hovered,. Beam covered 6" rectangular area on ground. Several cinder-like rocks and charred pebbles in burned area. Analysis. 7 May 1967 02:00 - Edmonton, Alberta - Ricky Banyard, 14, saw a strange object in the sky and followed it with a friend, Glenn Coates, through binoculars. At around 2:00 am, a 14-year-old witness and his friends saw an object in the sky and followed it. The object passed near a cemetery, emitting a whistled whistle, emitted a ray of light, then left with a roar and a series of bangs. Calcined rocks were found on the site. Reference: Henry McKay UFO Archives. An object was sighted that had an appearance and performance beyond the capability of known earthly aircraft. One multi-colored domed disc was observed by two witnesses, a married couple, for over five minutes. 15 May 1967 22:00 - Scarborough, Ontario - An unidentified object was sighted, but with appearance and behavior that most likely would have a conventional explanation. One object was observed by three witnesses (Onley). 20 May 1967 - Falcon Lake, Manitoba - An object was observed. Physiological effects were noted. An unidentifiable object was observed at close range and caused physical effects. 20 May 1967 12:13 - Falcon Lake, Ontario - Michalac case. Prospector suffers burns and radiation-sickness-like symptoms after a close encounter with a red, glowing landed object. Voices could be heard within the craft through an open hatch. Official explanation: hoax. Objects were sighted that had an appearance and performance beyond the capability of known earthly aircraft. Two objects, about 40 feet across, were observed by one witness for five minutes. An object was observed. Animal reactions to the object were reported. One object was observed by several witnesses at a mountain. Five people saw a flying saucer that was bluish white, surrounded by light. It was moving about 50 feet above the trees towards Sherbrooke. After three minutes, it had disappeared behind trees. Hovering red light flew to Lake Erie. 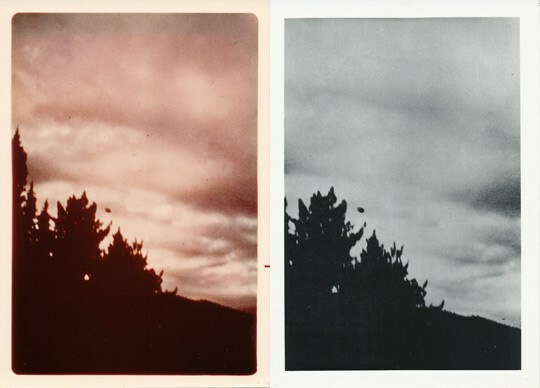 Two photos were taken of a disc-shaped object during the 20 seconds it was in view. It was said to be the size of a house and made a whistling sound as it flew. Red oval UFO approached farmhouse. May 31, 1967; 11:30 p.m. CDT. UFO came from south, stopped, hovered 125m away, white light on bottom brightened. Burned area 25' diameter, radioactive soil found at spot. A woman thought she saw a UFO with a bright light coming from the south. Her husband checked the site and found a circle of 25 feet (smoking two weeks later?). Reference: Henry McKay UFO Archives; APRO. A hovering object was observed. Multiple independent witnesses. One object was observed by four witnesses for 30 minutes (Bjornson). Psychologist and pilot neighbor saw two saucer-shaped objects. Shortly after 10 p.m., a Lake Nipissing, Ontario buoy tender observed green and white lights between two small islands. Thinking another boatman might be in trouble, the buoy tender headed toward the lights. He was about 100 feet away when the lights rose from the water 'with a whoosh' and sped off into the night. Dark stationary object in sky for 5 minutes, had vertical twin fins of flaming gases. 5 June 1967; 1:00 p.m. CDT. 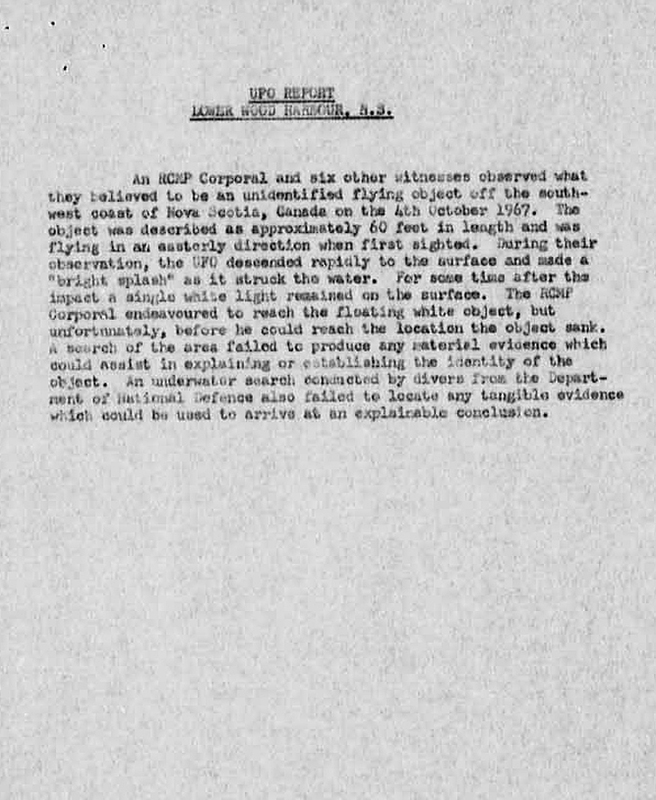 A Mounted Policeman and a Royal Canadian Air Force squadron leader saw a silvery circular or slightly oblong object flying rapidly to the north with a wobbling motion. The object was visible for about 15 seconds. (Winnipeg Free Press, Manitoba, 6/29/67, copy in NICAP files; Winnipeg Free Press 6/7/67 with date of sighting indicated as June 6, copy in NICAP files; case reported to the University of Colorado Project). 6 June 1967 13:00 - Winnipeg, Manitoba - RCMP Officer incident. 5 June 1967; 10:30 p.m. PDT. 6 June 1967; 8:40 p.m. CDT. A blue/white UFO was seen? 11 June 1967; 11:30 p.m. EDT. 11 June 1967 23:30 - Dorval, Quebec - Structured object at low altitude. 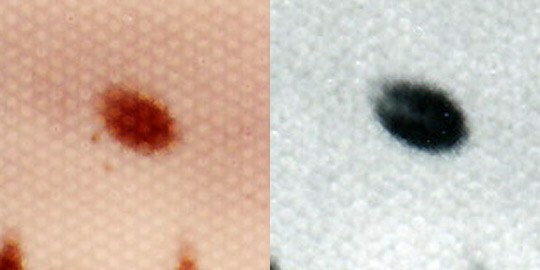 One white oval object was observed by two witnesses. June 13, 1967; 2:30 a.m.
13 June 1967 02:30 - Caledonia, Ontario - Cigar shaped craft with four evenly spaced small windows, 36' long; smaller disc 15' diameter. Both hovered 12' above ground. three small men, miner helmets on ground under boom on cigar. Ground marks. At 2:30 a.m. Carmen Cuneo, a night shift worker at a factory in Caledonia, Ontario saw two objects near the factory's scrap heap and dump area: a large cigar-shaped object on the ground, 35 feet long by 15 feet thick, and a hovering disc-shaped object about 15 feet in diameter. The smaller object, tilted up at a 45-degree angle, had a row of orange-lighted windows around its periphery. In the larger object were four square windows emitting a pulsating orange light, and from one end of it projected upward at a 45 degree angle a rod 15 feet long, bearing a large red light at the end. Beneath this light moved three small humanoid figures about three feet tall, wearing miner's hats with small lights on them. They were picking up and examining small objects on the ground with quick, jerky movements. After watching for 10 minutes, Cuneo called co-worker Marvin Hannigan to see it, but by the time Hannigan arrived the humanoids were gone. The two craft started very slowly to rise straight up into the air. After they reached a height of 50 feet they departed at about 40-45 mph without making a sound. At the landing site branches were broken and the brush charred, and an oily liquid was found on the ground. around. Later, a large hole and oily residues were found in the soil. 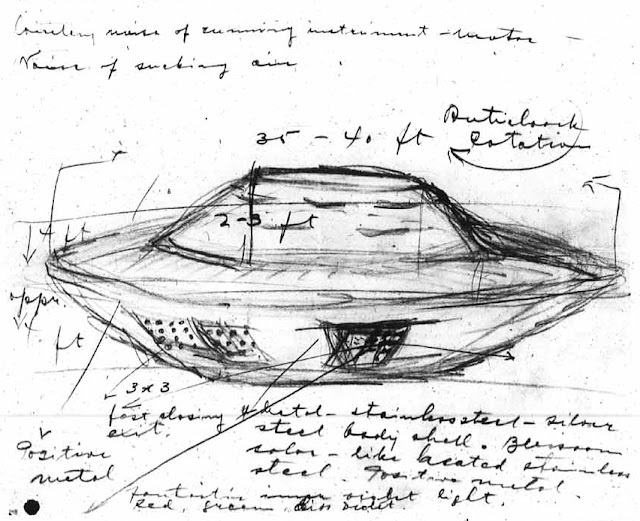 Reference: Henry McKay UFO Archives; CUFOR. Fireball or meteor, blazing orange with tinge of green, long trailing tail, showering blue balls. Bright white light with bluish-silver edges, moved fast across eastern horizon rapidly to the north, then shot straight up. Mrs. Wallace and family saw for one hour a cone shape with green and red flashing lights, rotating. At least five witnesses travelling by boat saw a bright object hovering over trees at a height of about 50 feet. The object suddenly descended and headed for the witnesses, frightening them. It chased the group to the shore and remained for 10-15 minutes. It was metallic and oval with a “rise on top.” The incident was very thoroughly investigated by the RCMP and RCAF. NRC Case N67/71. Men in black later interviewed witnesses. Men in black were encountered by one experienced male witness (Cuneo). A man in black was seen. Flashing white light shimmying from northwest . UFO at great speed stopped, moved off sharply in another direction. While camping four boys saw four UFOs from north to the south, at four different times early Sunday morning. Explanation: Satellite. 27 June 1967; 1:00 pm. CDT. 27 June 1967 23:00 - Winnipeg, Manitoba - An unusual object was sighted, that had unconventional appearance and performance. One domed disc was observed by two witnesses, a married couple (Hawryluk). No sound was heard. Oval illuminated object resembling flying saucer, noiseless, gained altitude east to the west. A meteor-like object was observed. One fiery ball was observed by two witnesses at a mountain. An object was sighted that had an appearance and performance beyond the capability of known earthly aircraft. An unidentifiable object was observed at close range (Pears). Several objects were observed by two witnesses for 90 minutes. Beeping heard. Whirlwind. Silent metallic box rotates in the air. Girl levitated. A woman was walking through her house around six o'clock in the evening in Thompson, Manitoba when she heard an odd beeping sound. It was repeated at regular intervals of about one second, and she wondered what was causing it. She looked out her kitchen window, and saw dirt and loose pieces of paper flying in a large circle around her house. Outside, she found her husband, who had just come home, and five children staring up into the sky. A young boy was holding her eight-year-old daughter down on the ground. Up in the sky a rectangular object hung in the air, slowly rotating counter-clockwise and showing alternating silver and black sides. 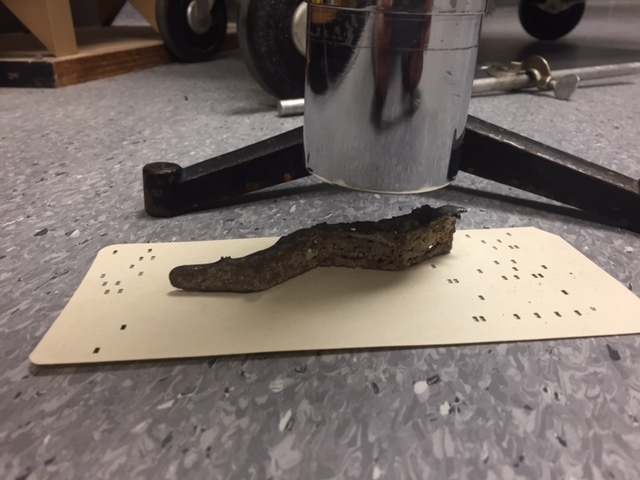 It was black on its lower surface, and made no noise. The object began moving off at an angle, stopped and hovered, then continued towards the southeast. Until this time the circle of dirt and dust had persisted, but it now died down. The whirlwind was confined to the area immediately around their house and did not affect any other houses on the street. When the object moved away, the dirt fell to the ground. Going to the children, the woman found they were calming down except her daughter, who seemed dazed. The boy explained that the five of them had been playing in the yard when the object first appeared overhead. As they watched, her daughter had been levitated into the air, apparently caused by the UFO in the sky. By the time the other children had come to her aid she was about one meter off the ground and her clothes had edged up her body. Her daughter said she did not remember anything from the time she felt the wind until the time she recovered after being dragged back to the ground.